With apologies to Dunne, Sibley, and Sutton, I’ve plucked the title to this edition of Notes From The Field from their book, Hawks In Flight, published some twenty-five years ago. It’s a fascinating book chock-full of details about identifying raptors in flight, old timey fuzzy black and white and grainy film images of distant sky bound hawks and, given that Pete Dunne is one of the authors, evocative prose that, despite the plethora of identification details, speaks to that part of the human soul that requires of us that we stop and watch whenever a bird of prey flies over, often with a tingle up our spine and a longing in our heart. I apologize further for disagreeing with them on their choice of the raptor family, the buteos, to which they’ve attached the aforementioned label “windmasters.” Me, I’m going with the kites, knowing that the kite with which Benjamin Franklin so famously and dangerously experimented in 1752 was eponymously named for that family of most graceful avian aerialists, and not vice versa. “Kite” comes to us from the Anglo-Saxon “cyta,” and the etymological root is “skut” which meant “go swiftly” and probably referenced the speed with which raptors swoop or stoop upon their prey. “Swoop” defines the kite family of raptors, and is what I’m watching right now. I am sitting on a sundown bluff overlooking West Cache Creek which flows through the granite mountain uplands of Wichita Mountains National Wildlife Refuge in southwestern Oklahoma. Northern Bobwhites call in the distance, but the Mississippi Kites coursing overhead have all my attention. The setting sun plays tag with small clouds gathering just above the western horizon. When the sun achieves enough separation, the light on the kites is photo perfect, illuminating also the hundreds of dragonflies flitting above the creek to great heights as they feast on swarms of gnats and try to dodge the hungry kites on their final feeding foray before nightfall. If you’ve ever watched dragonflies closely, or tried to net them as professional odonatists do, you know how erratic their flight path can be as they accelerate, hover, turn on a nickel and stop on a dime while capturing their own insect prey. Hummingbirds astound us with the things they can do on wing, but hummingbirds only wish they had the aerobatics of the odonata tribe. 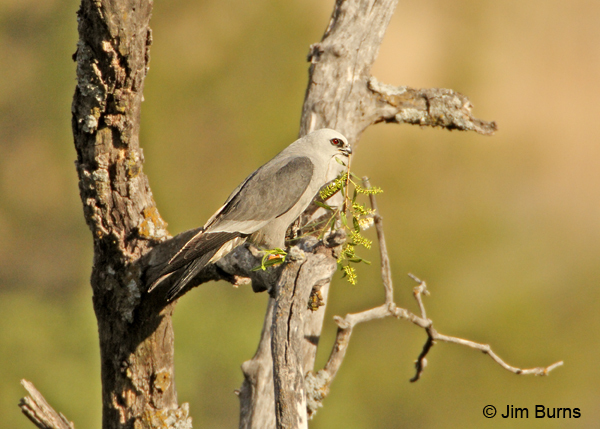 And dragonflies are a major prey item for Mississippi Kites. Imagine the skill set required to catch dragonflies on the wing. There are five kites in sight at this moment. This is a species known for hunting in groups, but I know this is not a family group because two of this “flock” if you will, are a mated pair nesting somewhere in the creek bottom below me, and it is much too early in spring for them to have produced young. These are all adults either on territory, setting up territories, or looking for mates. “Aerial ballet” would be the perfect phrase to describe how kites hunt on the wing, the smooth parabolas and gentle arcs nothing like the frenetic stop and go, twist and turn movements of their primary prey. And of course, though I’m not seeing it now, they can hover in place, the most recent etymological evolution of the word “kite” applied to both raptor and childhood toy. To finish the litany of their flight capabilities, don’t forget that these beautiful little raptors typically dispatch that prey and eat it on the wing too. This group of five rarely interacts in the air, instinct seeming to help them avoid one another just as instinct helps them intersect with the flying dragons without mimicking the latters’ frenetic flight pattern. The hunters spread out over perhaps a square mile, coalesce again toward the center, then move off yet again into the deepening twilight. That center is reasonably close, sometimes right above me and, captivated by the asymmetry of this soaring, gliding sky dance almost devoid of all wingbeats, I continue shooting long after the light is too low to capture sharp images. These images will be art shots or “pleasing blurs,” and I can’t help but entertain a moment of pity for the little dragons at the cusp of each precisely timed avian arc. It is difficult, with most raptor families, to divorce the beauty of the hunt from the violence of its conclusion. Not so with the kites whether it be the small size of their aerial prey or the distance at which that conclusion occurs from the observer and, if you were really adept with your kite as a kid, you know more wind made for more flight time and more aerial artistry. The west winds of evening confirm the verity of this for these avian hunters as well. The sun has succumbed to the western horizon. The dragons have all hung up for the night. The show is over. The clouds are building, but the sundown sky has a reddish glow. “Red sky at night, sailors’ delight.” I am hoping the old aphorism is true, giving me, tomorrow, one last day of fair weather to watch the windmasters in action. I have not found the actual nest site of the pair in the watershed below me, but I have discovered the female’s two favorite loafing snags which, short of prey delivery to nestlings, have afforded me wonderful, adrenaline pumping insights into the life history of Mississippi Kites and the opportunity to photograph those special moments. I have dozens of flight shots, but it is a somewhat standing joke among bird photographers that copulation is the ultimate image. 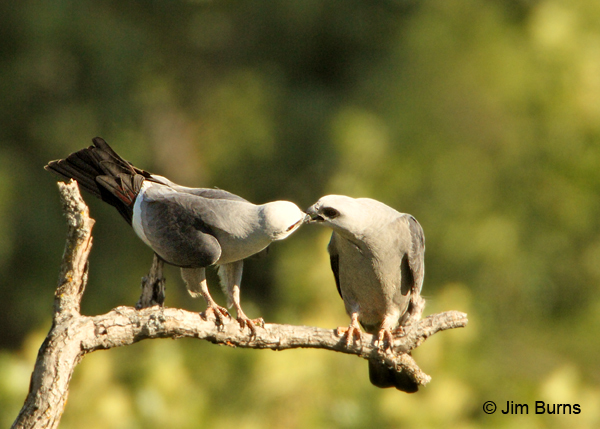 I have machine-gunned the shutter on half a dozen of these actual mating events, but in retrospect there are three other image sequences I find ultimately more satisfying symbolic representations of Mississippi Kites, perhaps because they show a more human, less animalistic side of this species. Yes, I am guilty as charged of anthropomorphism. I have shots of the pair resting side by side on a tree limb in the shade of the overhead canopy, out of the midday heat. She is quite noticeably larger than her mate, and her plumage is noticeably darker. Perhaps she is several years the older of the pair, or perhaps an age disparity is simply inferred because the smaller male brings her prey items periodically during the day, seemingly a gesture of deference though she does go off hunting some on her own. Another favored sequence depicts an actual prey exchange, she waiting regally on her snag throne, he flying in with prey in beak to a nearby snag and awaiting some signal invisible to me, perhaps a favorable wind direction, perhaps some ancient instinct buried deep within his Mississippi Kite DNA? Then he flies to her, perfect landing on the snag of course, and gently reaches the item to her, beak to beak. That is probably my favorite image from the week’s observation of this pair, mostly in late afternoon and evening because of the light direction, but I have another sequence with the female landing on her snag carrying in her beak a small branch of greenery, obviously on her way to the nest to weave it into the tapestry of their life together this breeding season. It occurs to me that I will, after all, forego looking for the nest itself. Its discovery would only be anticlimactic, especially this early in the nesting cycle, and my vantage point on the bluff has already provided me all the other highlights of Mississippi Kite life. In fact, if tomorrow brings fair weather, I may not even bring the camera. I may just sit on the bluff unencumbered by recording devices other than eyes and brain, reveling in the sense of freedom and joy this species’ awesome flight capabilities brings to us and seemingly to them. Wishing Dunne, Sibley, and Sutton were here.